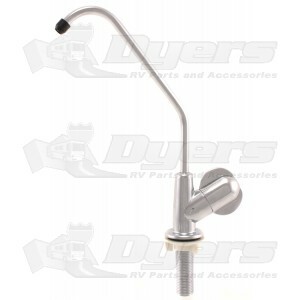 Dedicated drinking water faucet features 10" tall swivel spout and easy to use on-off handle. Requires approx 7/8" single hole to install. Threads stripped out on the first one, so I ended up with chrome instead of brushed nikel. Faucet worked for several years, but dripped a little the whole time. Finally after about 6 or 7 years, the cartridge started to leak, so I replaced the whole faucet with a competitor model. I was thinking that it might be a lifetime warranty on the cartridge, but no such luck. I purchased mine from Menards and they no longer carry this faucet. Probably because there were too many returns.